Last edited by tater1977 on Wed Aug 15, 2018 11:16 pm, edited 1 time in total. So the lead track we're really excited to share with the audience, and it's called "No Erasin'," so just tell me about this song in particular. "No Erasin'" is a song about two people who go to a class reunion and they see each other for the first time after years, and they both have separate lives with people at home, but they remember what they used to have when they were in high school, and high school is always an amazing place in your heart. And they kind of go outside to get away from the environment and talk a little bit, and they go sit in her car, and they go for a ride, and they get in the back seat of her car and they talk about old times, maybe a little smooch here and there. Nothing bad. But it's just a reflection of what they used to have and how important that is. I imagine you're performing this song for an audience, there have to thoughts of some old times with the fans. That's funny you say that, because it really is exactly a double meaning, because at some level the relationship I'm talking about is the relationship with the audience too. I know "it's been a long time coming since I saw your face", because it has been. And "no running anymore / my soul's burning just like it did before" — there's a lot of metaphors of that nature about performing and being in front of people again, which will lock up to the lyrics when that happens. Wow - thanks Tater! What a great interview. It sounds like he may being doing some live performances at some point. I'm going to find a way to be there! WOWOWOWOW. Steve Perry just sent us something amazing. A new song. His first music in 24 YEARS! He also sent WBLM this letter which we wanted to share with you. He's on the phone on air now. He’s back! It’s true! Steve Perry, aka “The Voice” and former singer of Journey… is… back! In fact, Steve Perry did an exclusive, intimate interview this morning on Lite Rock 105! Did you hear it? SP says they are talking about a small tour and may look up some old musicians. Last edited by tater1977 on Wed Aug 15, 2018 11:18 pm, edited 2 times in total. Havent listened to this yet, but he has a sit down interview with KQRS here locally. Be curious if was in studio. Tom Barnard sits down with Steve Perry for an intimate conversation on the eve of his first new album release in nearly 25 years, Traces (October 5). Steve talks about his life, music and reveals for the first time why he chose to step away from Journey at the height of his success. 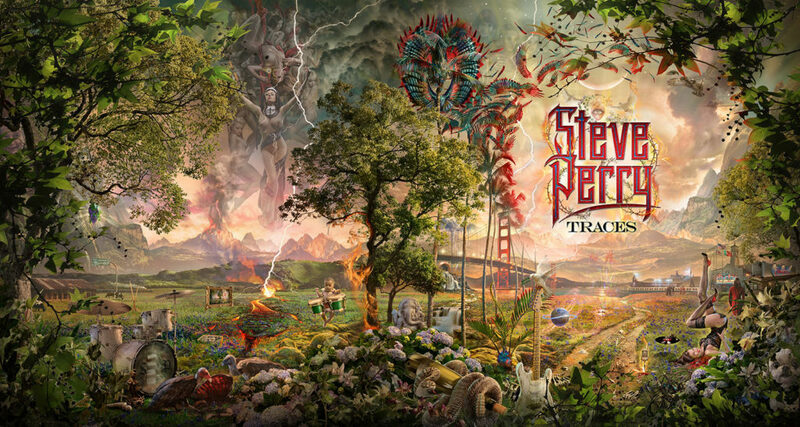 Traces is due out October 5th. scarab wrote: Havent listened to this yet, but he has a sit down interview with KQRS here locally. Be curious if was in studio. Sounds like he's over your way. I get to talk to Steve Perry from Journey this morning! Are there any questions you want me to ask him for you?! He was there. There's 4 or 5 photos on the page. tater1977 wrote: He’s back! It’s true! Steve Perry, aka “The Voice” and former singer of Journey… is… back! Great interview!! She's a true fan ,very emotional about hearing his voice again. I can definitely relate. tater1977 wrote: Tom Barnard sits down with Steve Perry for an intimate conversation on the eve of his first new album release in nearly 25 years, Traces (October 5). Steve talks about his life, music and reveals for the first time why he chose to step away from Journey at the height of his success. Wow, can't wait to have a closer look at the front and back of that cover! Thank you for sharing all of these clips. Exciting times! The album cover reminds me of Elton John's Captain Fantastic album art. Lots of hidden messages in there. I have to go back later tonight and check them out after the kid is in bed, so it's helpful to have one place to look. Having a 3 year old running around interrupts my fandom. New Music & Video From Steve Perry of Journey! It took almost 15 years for Steve Perry to find his passion and his love for music once again. He went back into the studio and has a brand new album coming out called Traces with the first single f “No Erasin” already playing on KOIT. Now you can hear the new song and watch the brand new music video for it. Then after that check out the interview that I did with him on our podcast. We talk about why he was gone so long and what made him decide to get back into the music industry after all this time. This is my favorite interview so far. laughs. Sounds like he's having fun. Great to hear some history on the LP's cover. Lora, so true! What a GREAT INTERVIEW, and you can hear it in HER VOICE, how she almost breaks down in the first few minutes. So great! tater1977 wrote: Great to hear some history on the LP's cover. I hope he eventually explains the imagery on the cover. It is SO DEEP and complex and everything there has a meaning. Most people are only looking at the front cover and not the whole image. I hope a high res image of the entire album shows up so you can really see all the detail. Everytime you look at it, you see something new. and Kellie smooching on the bridge. but man there's a lot there. Steve said the white shih tzu there is Kellie's dog. Yeah - I heard that in the interview - I was just saying that the dog and the lady we're the two things that threw me the most. The mystic symbolism seems to be a continuation of the TBF images. The stadium way in the background. What looks like possibly the guys from Journey very tiny. The tails, of course. The Portuguese flag... just tons. tedpruitt wrote: Yeah - I heard that in the interview - I was just saying that the dog and the lady we're the two things that threw me the most. The mystic symbolism seems to be a continuation of the TBF images. The stadium way in the background. What looks like possibly the guys from Journey very tiny. The tails, of course. The Portuguese flag... just tons. Thanks for the high res. I see a baseball in front of the base drum. S P on the base drum. Wonder what's in the picture frame? Yeah, that cover screams LP Record! I already ordered it on his site. I honestly thought this day would never happen! Who is hiding in the trees on the far left? Thanks, Ted. This is great. I don't feel it's my place to reveal too much, but the stadium on the right by the water is AT&T Park where Steve has enjoyed many baseball games. The Hanford Theatre is there and Fantasy Studios is on the far right. The tiny guys in the distance are not Journey.